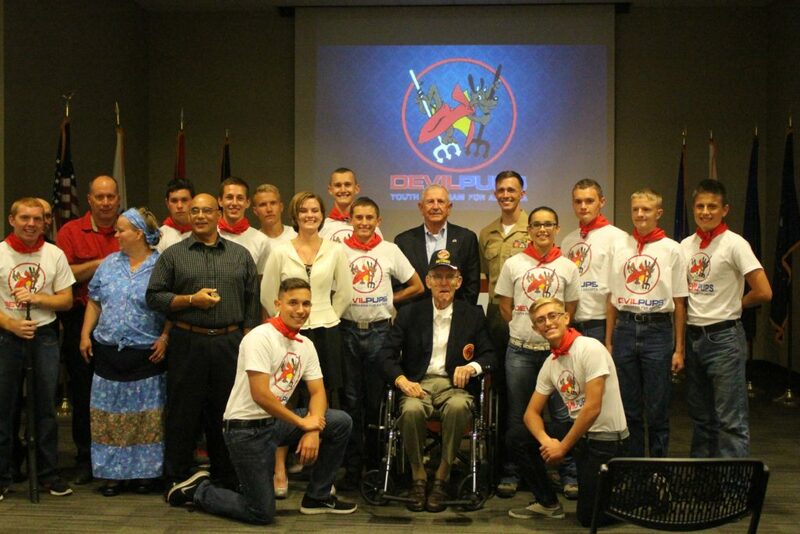 IVINS — As part of the “Devil Pups” graduation and awards ceremony Friday, a Marine lieutenant colonel received rare honors for his 40 years of service to the youth program. This recognition marks only the third time such an award in the Devil Pup program’s 62-year history. 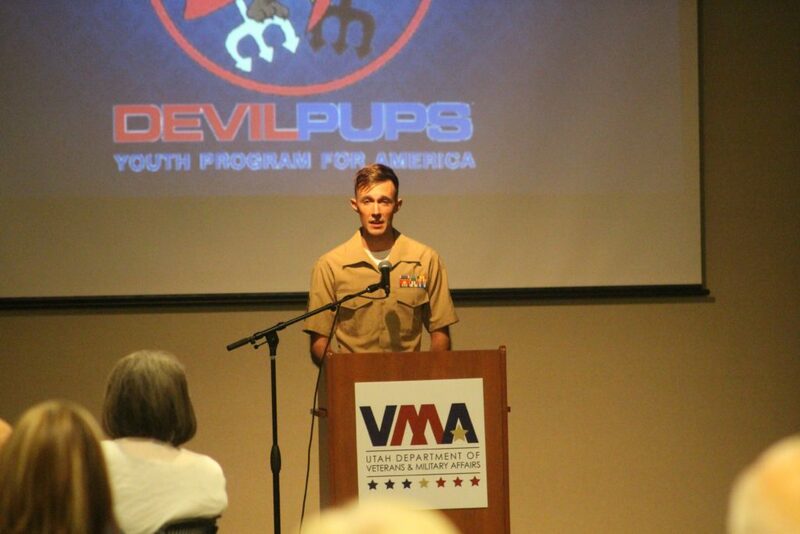 Every year, several local youths participate in the Devil Pups, a citizenship program that starts with spring training and ultimately takes them to a 10-day camp that mirrors the Marine Corps lifestyle. 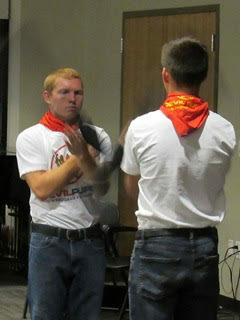 The training, held at Camp Pendleton, California, promotes cooperation, respect, team-building and dignity. 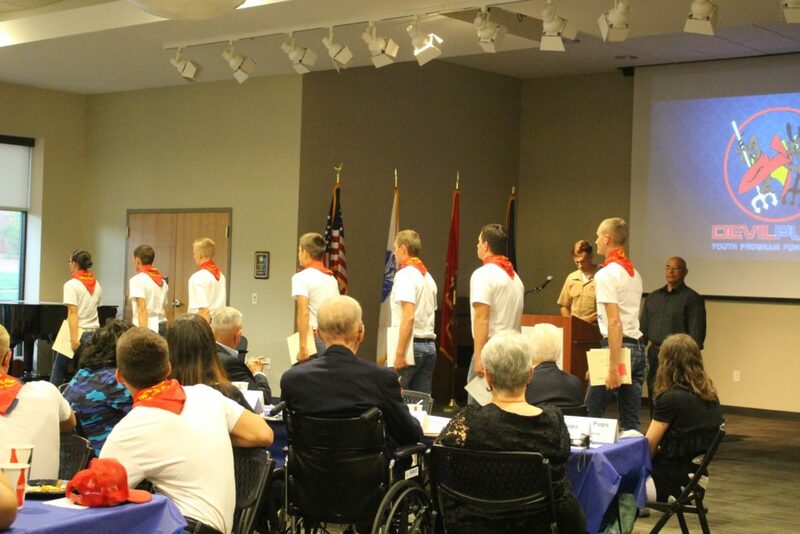 On Friday, seven participants in this year’s Southern Utah Devil Pups youth program and their families attended the awards ceremony held at the Southern Utah Veterans Home in Ivins to honor their achievement. 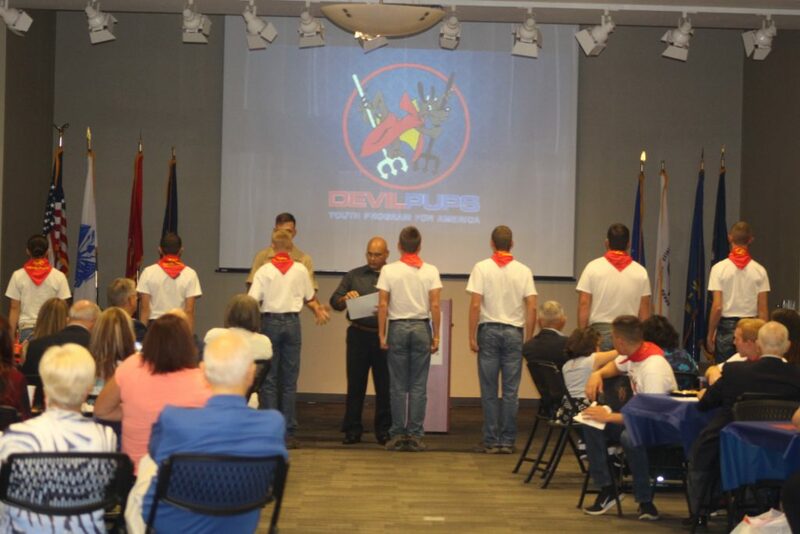 Each Devil Pup was presented with a Southern Utah Achievement Award Certificate and the “George Class Devil Pups Encampment Ribbon” for their uniform. The encampment ribbon is in honor of U.S. Marine Maj. George Class, who passed away April 12, 2012. 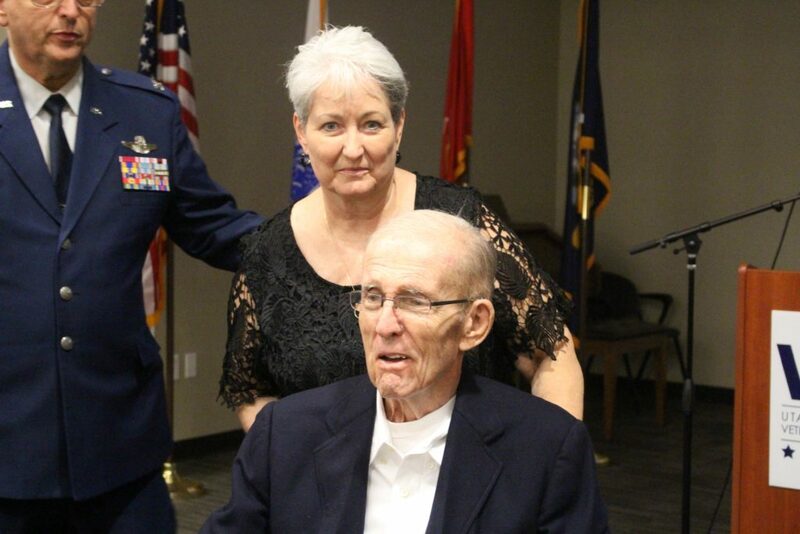 Class served his country for 33 years as a Marine, in addition to serving as the northern Nevada liaison for the Devil Pup program. Graduating cadets included Josh Mathis, Logan Miller, Spencer Salsbury, Jeff Stouffer, Braxton Summers, Antesha Tate and T.J. Charter. Past graduates participating in the event included Cole Cutner, Logan Miller and Jack Wright. Future Devil Pup, 12-year-old Justice Johnston, received the “Honorary Devil Puppy Award” from her father, U.S. Marine Sgt. Billion Johnston. 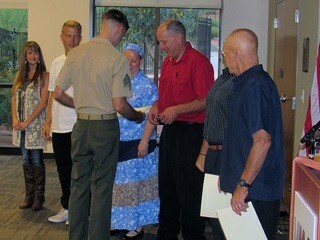 The award was given to Justice for her commitment to workout with the Devil Pups during the summer to help them prepare for the 10-day camp, Billion Johnston said while presenting the junior award to his daughter. 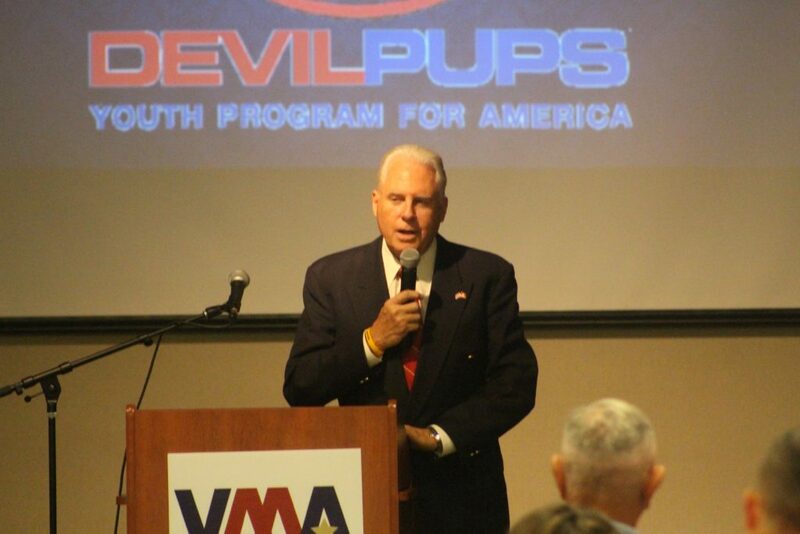 In addition to the awards for the Devil Pups, another award was presented Friday evening as well, one that has only been granted three times in the youth program’s 62-year history, Devil Pups president and CEO Richard Linsday said. 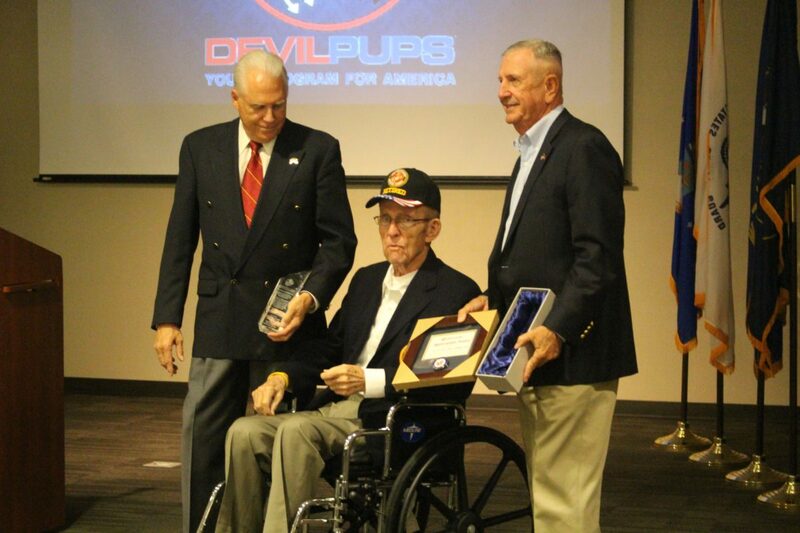 The”Lifetime Achievement Award” was presented to U.S. Marine Lt. Col. William C. Toole for his dedicated service to the Devil Pups spanning more than four decades. 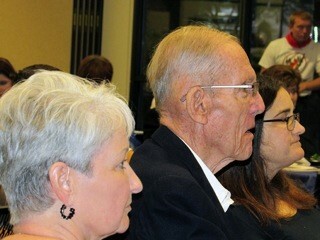 Toole, who sat in the audience next to his wife, Donna, was the man responsible for bringing Devil Pups to Southern Utah. 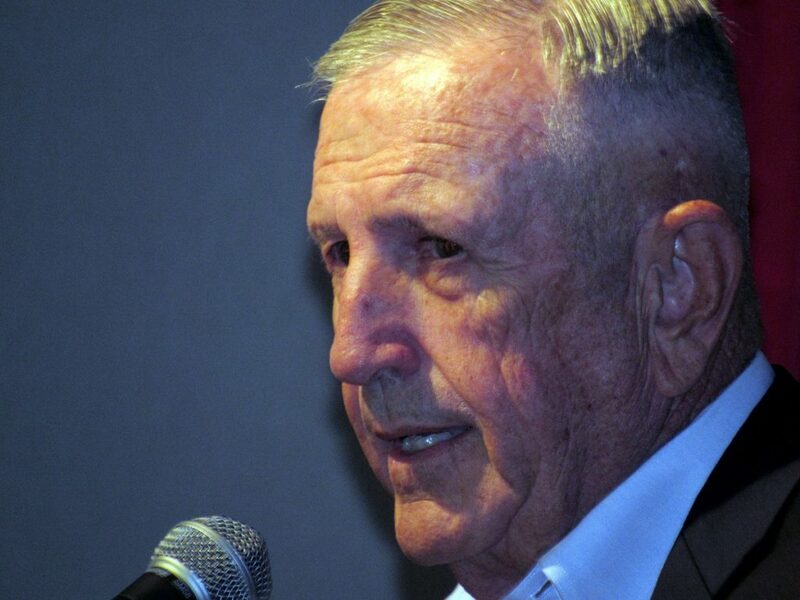 He graduated 71 Devil Pups during his tenure as program liaison while also serving in numerous positions within the organization for more than 40 years. 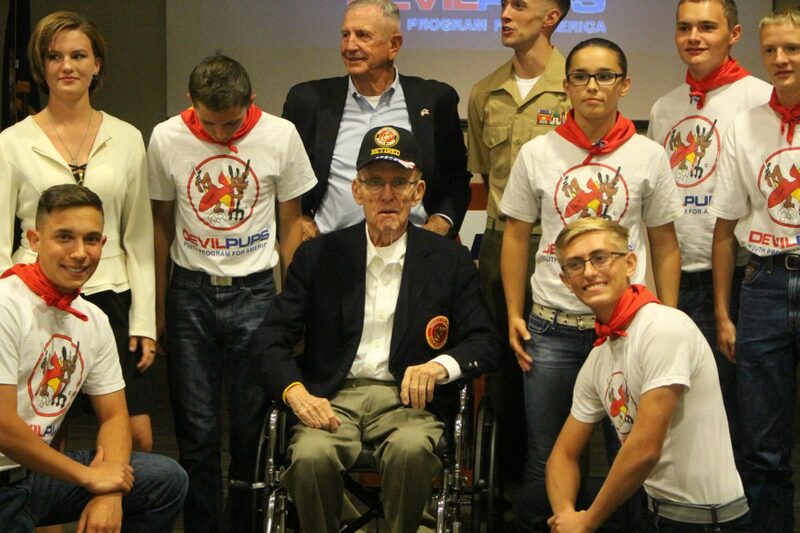 Born in Rochester, New York, as the son of a WWI veteran, Toole served in the United States Marines for 29 years, after which he went on to volunteer in the Devil Pups program starting in 1954. Linsday and Devil Pups board member Marine Col. Ray Blum, both longtime friends of Toole, traveled from California and were joined by Devil Pups coordinator Heather Ham to present Toole with the distinguished award. Linsday stressed the importance of the youth program and said it helps to direct these youth during a difficult time of development and provides the leadership, direction and mentoring that can change their life. 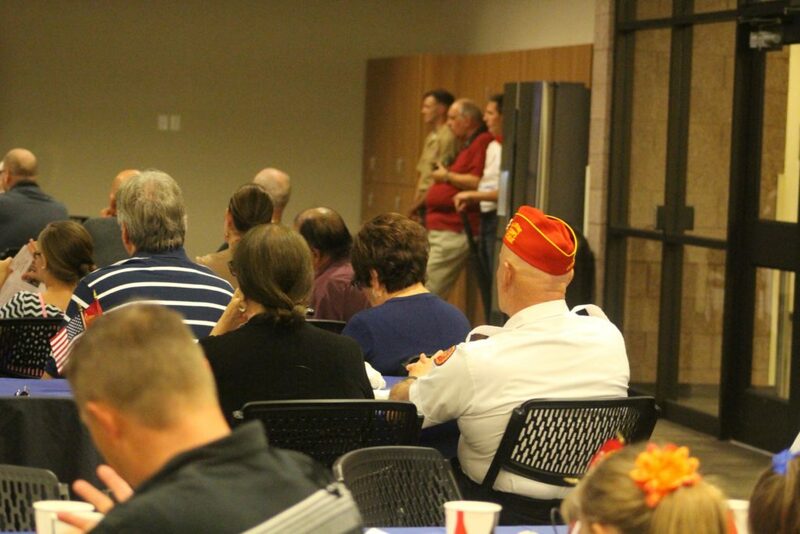 Blum said he met Toole while serving in the Marine Reserves initially. 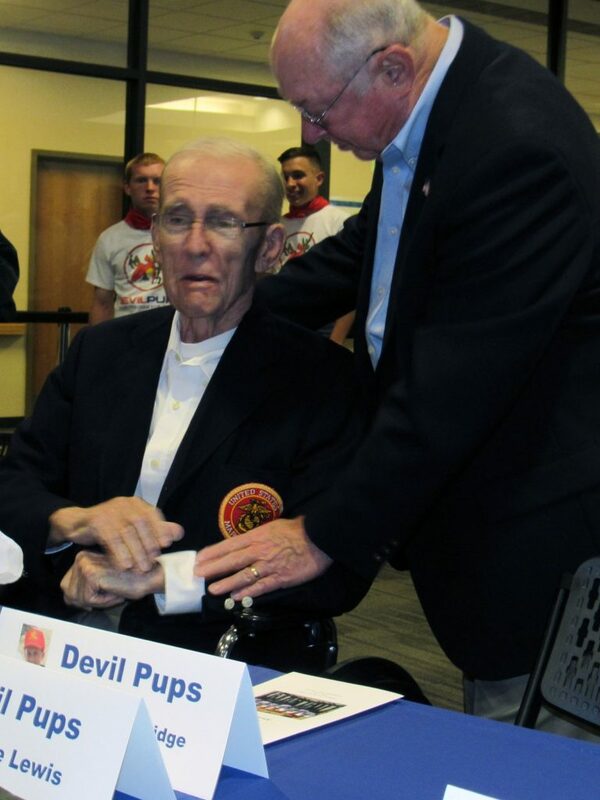 Later, they met up again and continued their friendship throughout the years, spending nearly 40 of them together in various areas and positions in the Devil Pups program. Blum attributed his involvement, at least in large part, to Toole, he said. 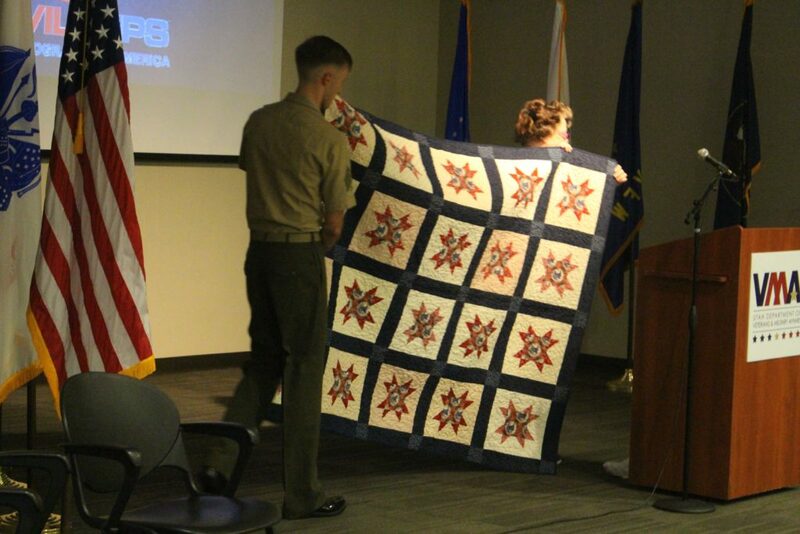 Toole was also presented with a handmade “Quilt of Valor” by Doreen Wells and Mickey Austin. 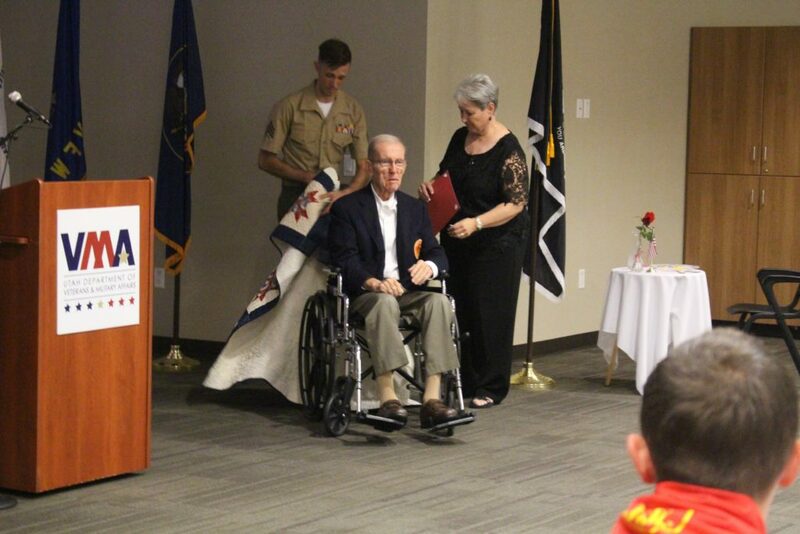 “For all of the years of service to your country,” they said as they wrapped the quilt around Toole’s shoulders. Quilts of Valor have been handmade all over the country, the first in 2003. Every handmade quilt is one of a kind, except for a patch on the back that has the veteran’s name, branch of service and how long he or she served. The Devil Pups is a nonprofit organization that offers a demanding physical and academic citizenship program for young teenagers. Devil Pups is a camp comprising 10 days of challenge, teamwork, discipline and education for boys and girls between the ages of 14 and 17.